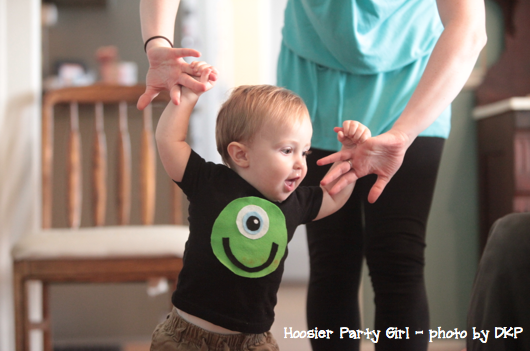 The theme for this first birthday party was Monsters. 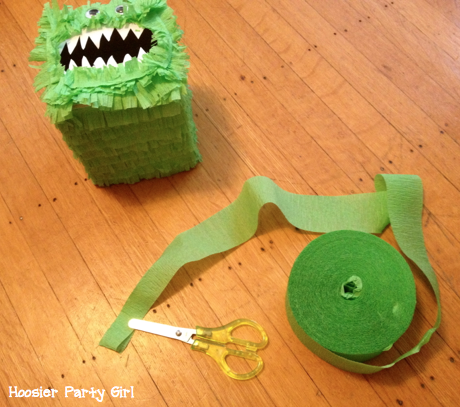 Here are just three of the monsters that I made for this party. All were inexpensive and easy. 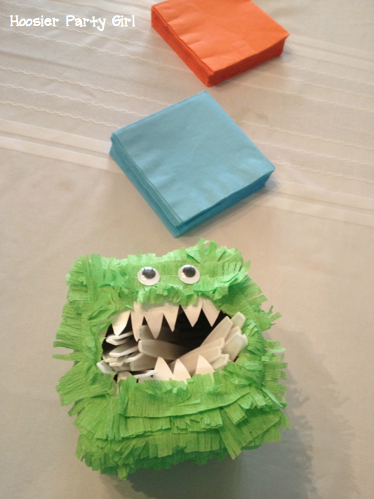 The supplies for this guy were practically less than $2: an empty tissue box, scrap printer paper, streamers, adhesive, and goggly eyes (just two in a large pack I bought for many projects for this party). 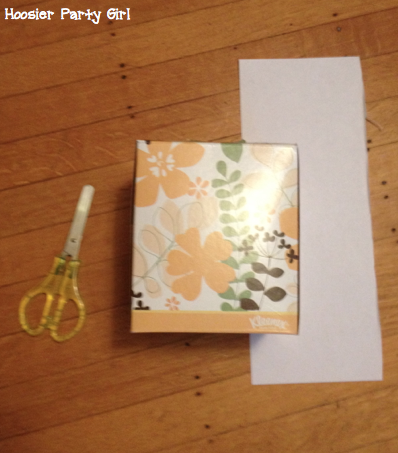 First cover the box in white paper, so you don’t have a flowery monster. I cut the square for the top, gently folded it in half and cut out his toothy mouth. Making him furry takes a little time, but it is not hard. Cut the streamer into strips; I tried to make most of mine just a little longer than going all around the box. Fold each streamer strip in half (making it thinner not shorter). Cut fringe on the ends. Glue the folded (and not cut) side to the bottom of the box. Layer strips as you work up to the top. The face required shorter strips and more creative angles to get it to look right. The goggly eyes were the last thing added. I had tons of streamer left over (still do), so I used the left over poster board from the Mario photo frame to make this guy. Since he has curves, there was a little trial and error to get the streamers layered the way I wanted them to be. 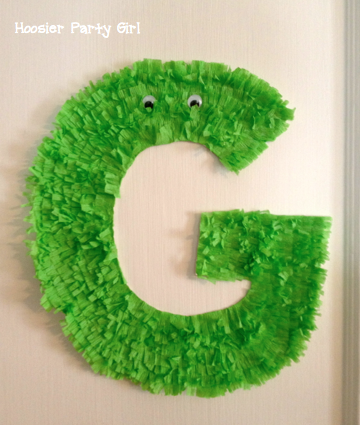 (You can also use this same technique to make home made piñatas without paper mache.) Mostly I worked from the outside to the middle. He looks very “Sesame Street”, doesn’t he? I had envisioned a lime green t-shirt or onesie, but this was what was available in the right size at Hobby Lobby. I believe it was $2.99. The felt was 4 for a $1, so I grabbed lime, light blue, white, and black. I used heat ‘n bond to attach it to the shirt, but I can’t tell you what that cost because I grabbed the wrong stuff and had to use the heat ‘n bond hem tape I already had at home. 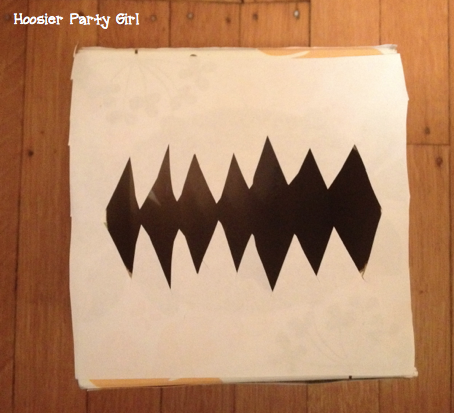 Everything was cut free hand, but I did use cookie cutters and other circular objects I had available to trace so I could stay mostly circular. 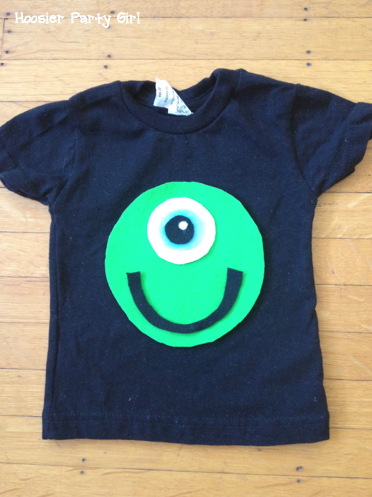 I actually had plenty of felt to make two monsters and I nearly made myself a matching shirt. I think he was pretty adorable! Danese Kenon took photos during the party, and this last one is one of hers. You will see more of her photos when I do a round up of the party. Ignore the pizza on his shirt; it washed right out. I was able to wash this in the washing machine without issue, but I did not dry it just to be safe.